BANGKOK, Jan 12 (TNA) - Pledging that Thailand will continue to assist Timor-Leste in economic activities, the heads of government of the two nations on Monday witnessed the signing of a memorandum of understanding (MoU) on energy development. The signing took place at Thailand's Ministry of Foreign Affairs and was witnessed by visiting Timor-Leste President Jose Ramos-Horta and Thai Prime Minister Abhisit Vejjajiva. Under the terms of the agreement, Thailand's oil and gas conglomerate PTT Public Co., Ltd. and Timor-Leste's Ministry of Natural Resources will cooperate on energy development with Thailand also providing budget assistance to Timor-Leste officials to study management and energy technology implementation from PTT, Thailand's largest energy firm. 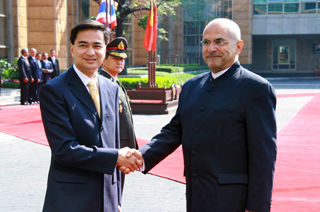 In an attempt to strengthen relations between the two nations, Mr. Abhisit reportedly told Mr. Ramos-Horta that the Thai Foreign Affairs Ministry is ready to extend the earlier MoU on economy and technical expertise which expired in 2007. Thai officials will visit East Timorean capital of Dili to discuss details and review bilateral cooperation in the near future. Also, Thailand as current chair of the Association of Southeast Asian Nations (ASEAN) will support Timor-Leste in becoming a member of the regional group in 2012, Mr. Abhisit reportedly told Mr. Ramos-Horta during a meeting.